ShrinkTheWeb How Do I Turn on Full Logging/See Bad Requests? Click the Manage Security Settings link. Check the "Full Logging" box and then click the button at the bottom of the page. Note: This should only be used temporarily to find and correct bad requests that you are making and likely being charged for. You can also determine if requests are being made by someone other than you. Full logging is disabled nightly. 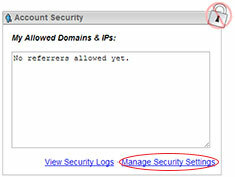 To view the security logs, find the Account Security section in the ShrinkTheWeb Dashboard. 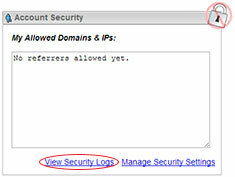 You can view your logs by clicking the "View Security Logs" link located in the Account Security box. Note: Please ensure that an adequate amount of time has passed to log requests. To troubleshoot failed requests, clear your server image cache and visit the page on which your images are failing to display (prior to midnight) to force log entries. Note: These logs are cleared monthly. You will also find details of each request by hovering your mouse over the "question mark" (?) to the right of the status message. The above screenshot also shows a successfully queued "Notify Callback", while the below screenshot shows a "Notify Ignored (Blacklist)" due to a blacklisted notify callback URL. NOTE: In order to considerably cut costs, please note that when numerous accesses are made within a given second, they may appear in the logs with inaccurate timing (not in the order actually made). Read more on why this is the case.